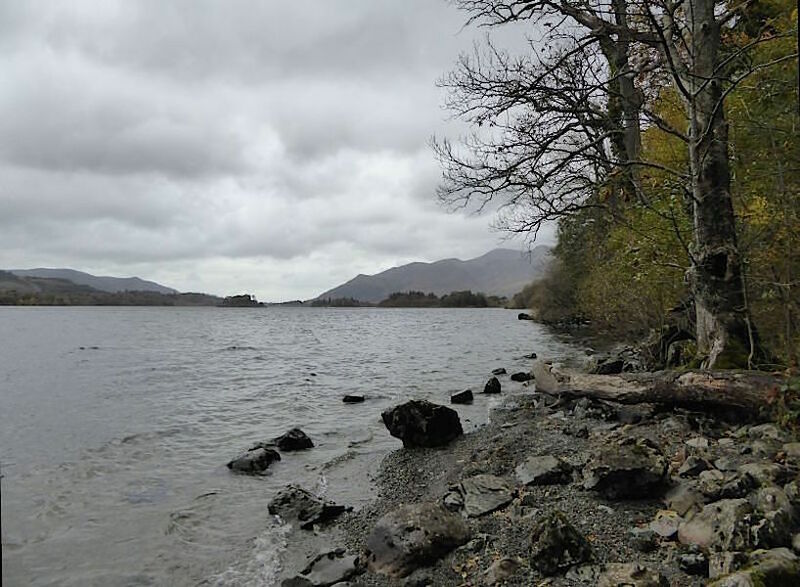 The forecast was a bit of a mixed bag today and nothing was certain, so we opted for a walk around Derwentwater rather than venture out on to the fells. 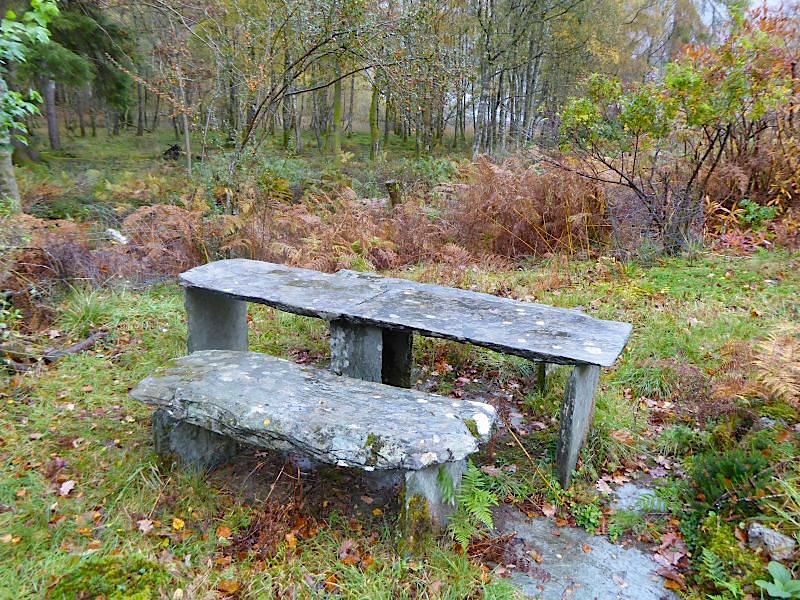 It wasn’t the best of days for being outdoors as it rained on and off all morning. The afternoon stayed mostly dry for us but the weather closed in and it became very windy for the remainder of the walk back to the boat landings. 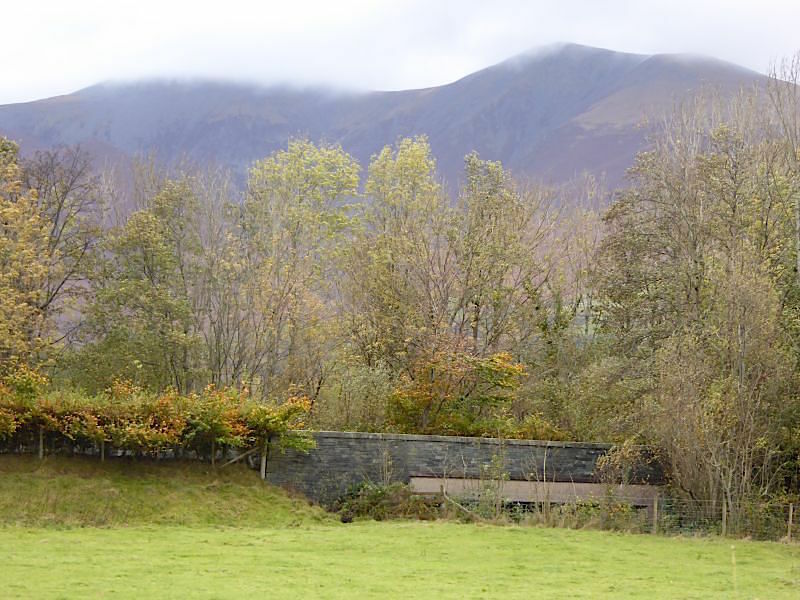 The day started off with drizzle and cloud over the Skiddaw fells. 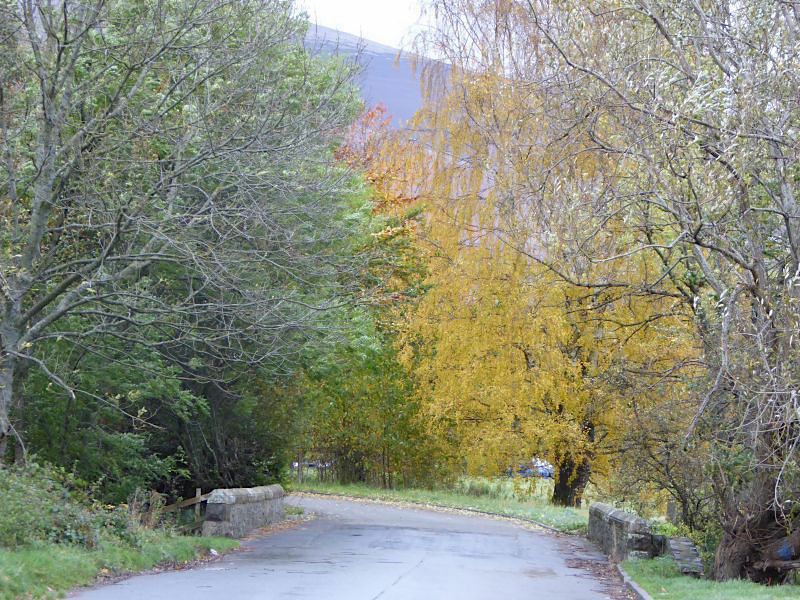 The trees along the road where we parked added a little colour to a very grey morning. Looking over Portinscale at the drizzle coming our way. 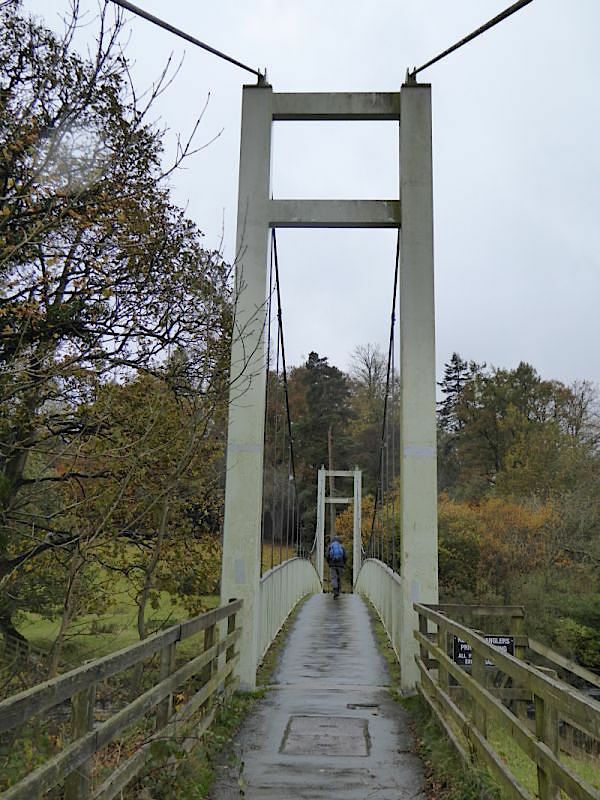 Off we go then over the Portinscale suspension bridge. The rain came over and now its chucking it down, but the ducks looked happy, even though nobody else did. 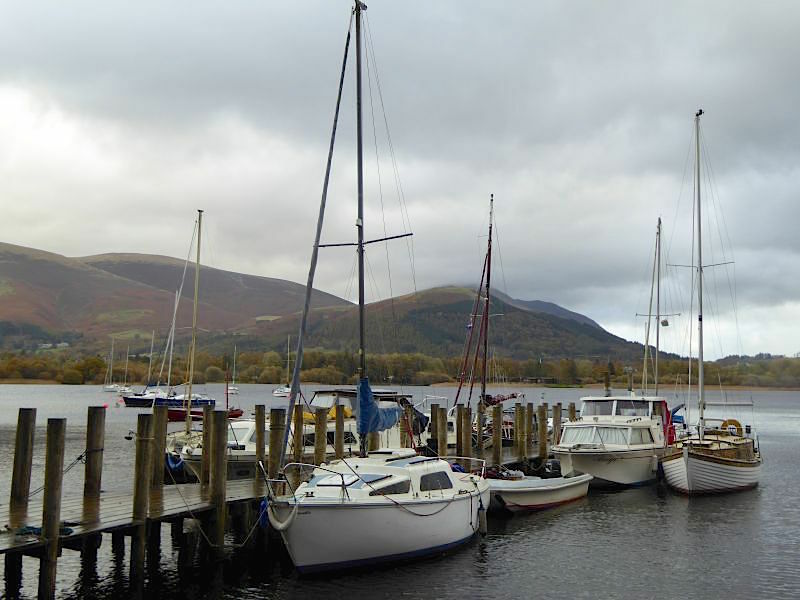 Grey skies over the Nichol End jetty. 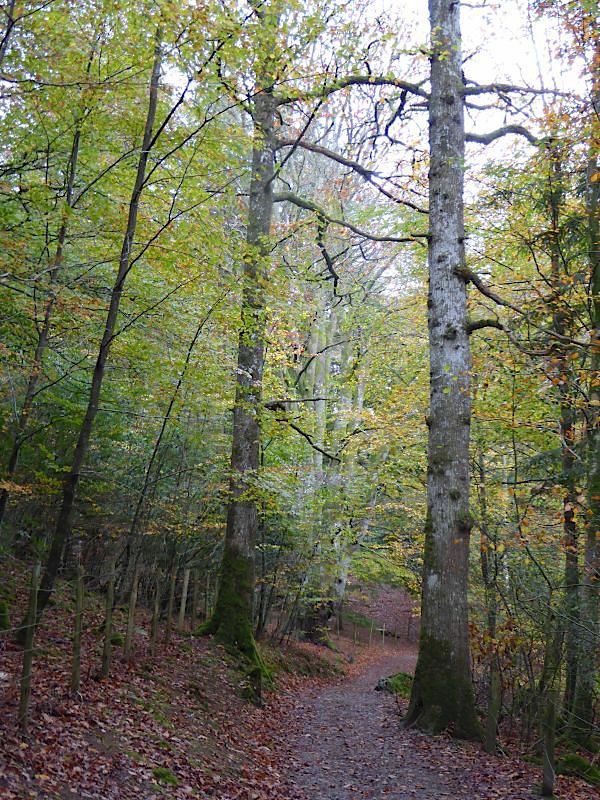 Continuing on through the woods towards Hawes End. Just beyond Hawes End we turned left and followed this path to walk along the lakeside. 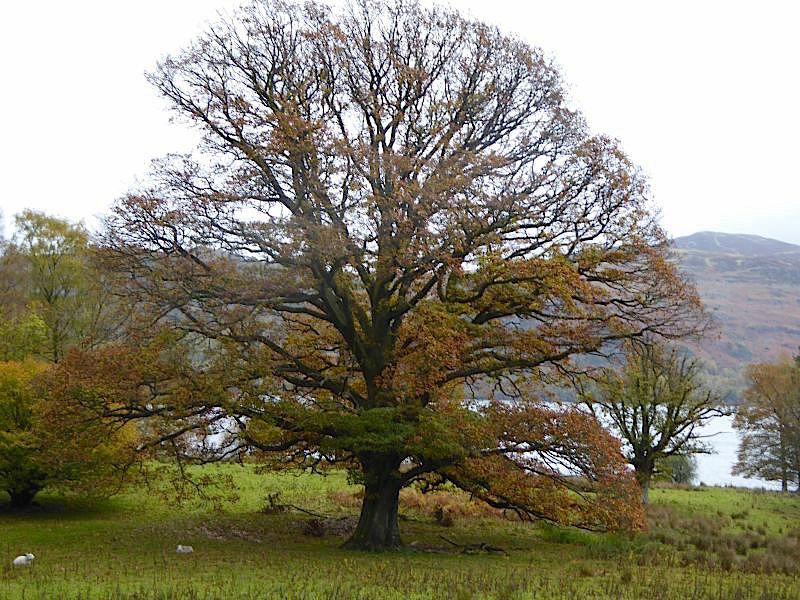 Last week’s winds have removed most of its leaves but the tree still looks impressive. 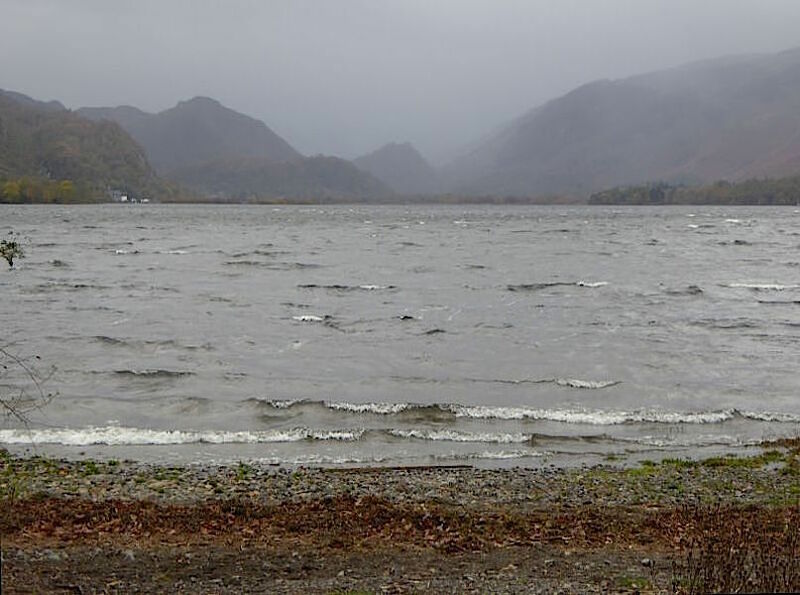 Looking across at the heavy rain at the northern end of Derwentwater. 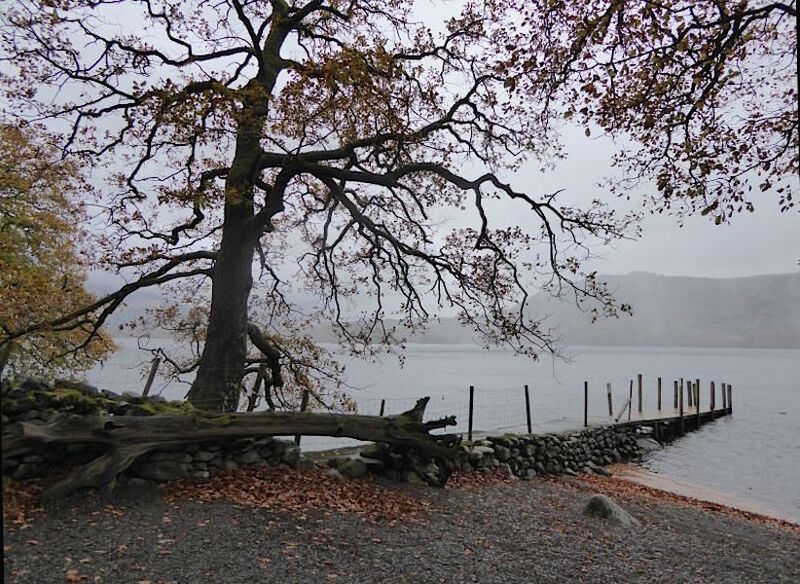 The landing stage at Low Brandelhow. 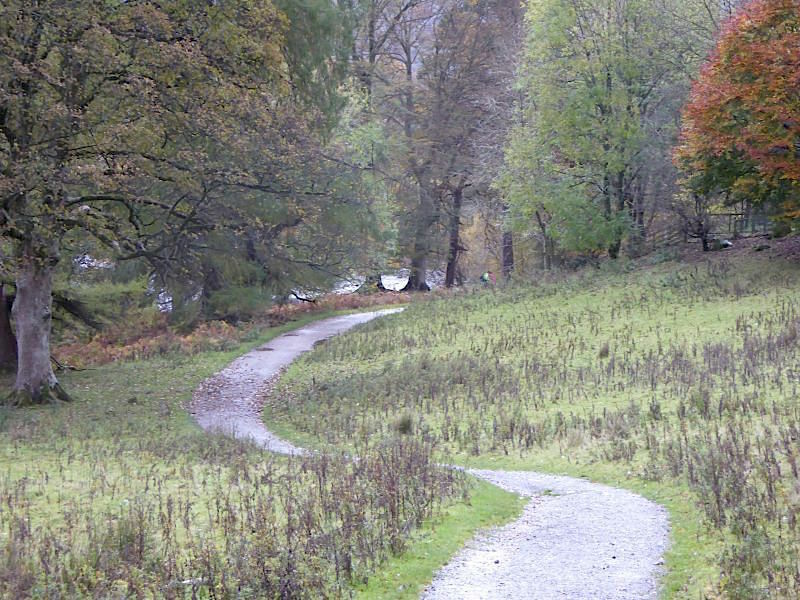 The lakeside path through Brandelhow Park. The hands are beginning to look a little weatherbeaten. 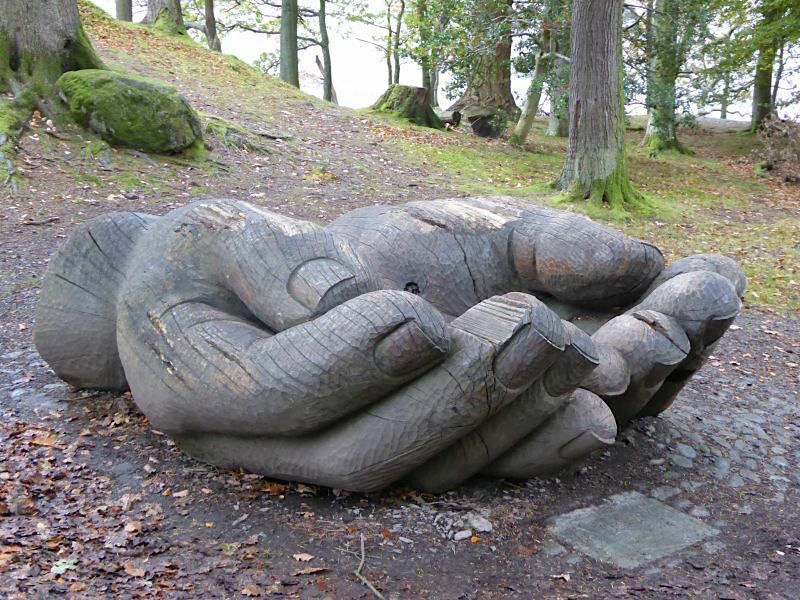 The sculpture’s official title is ‘Entrust’ and it was commissioned by the National Trust. 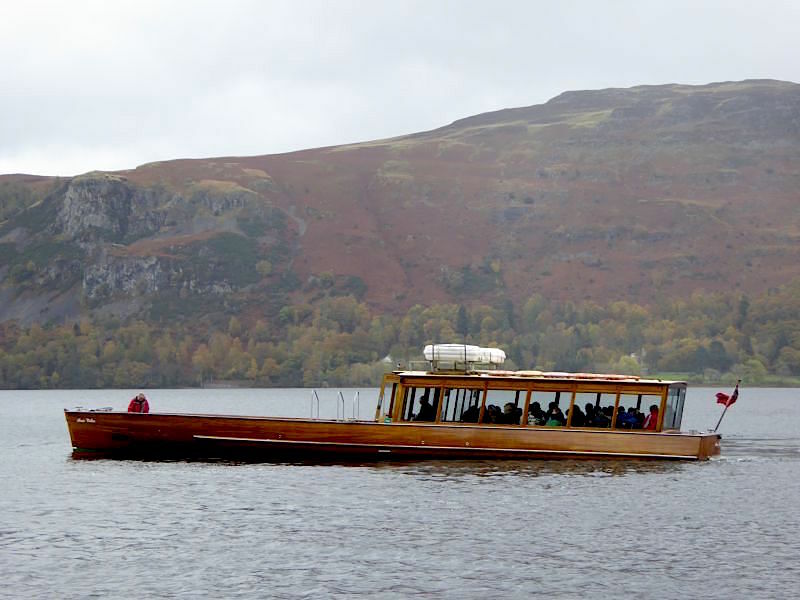 One of the Keswick launches arriving at the High Brandelhow landing stage. 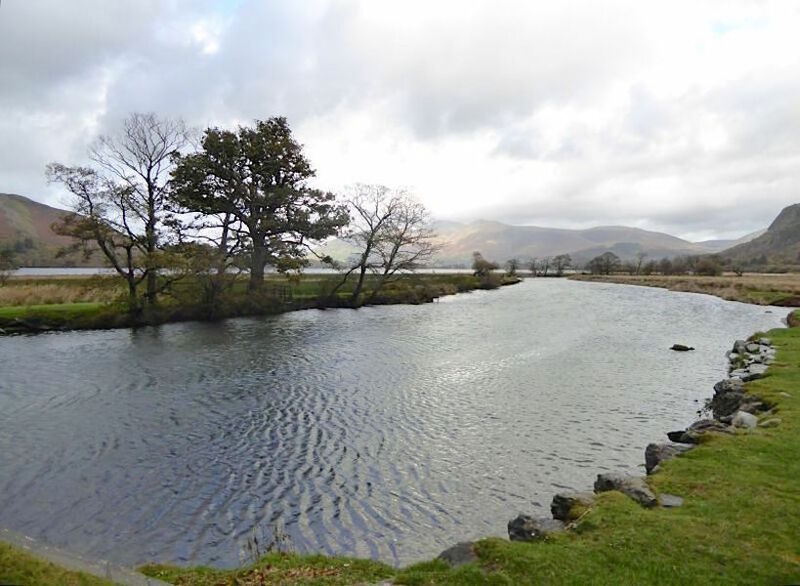 The landing stages have timetables near them, just like bus stops, so all you have to do is stand on the landing stage at the appropriate time, make sure that you are visible and then the crew will see you and come and pick you up. If there’s no-one on the jetty they don’t call unless, of course, someone already on board wants to get off. Everyone is safely on board so the launch backs out and heads on up to the next landing stage at Low Brandelhow. 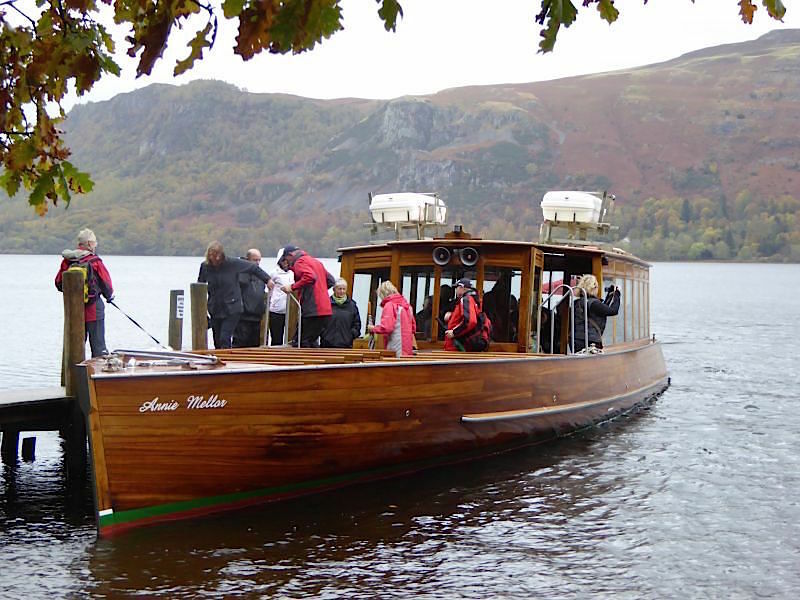 Some of the launches go clockwise, some anti-clockwise so you never have to wait long at a jetty for the next launch to come along. I didn’t see anything wearing a red jumper and yellow check trousers with matching scarf though. 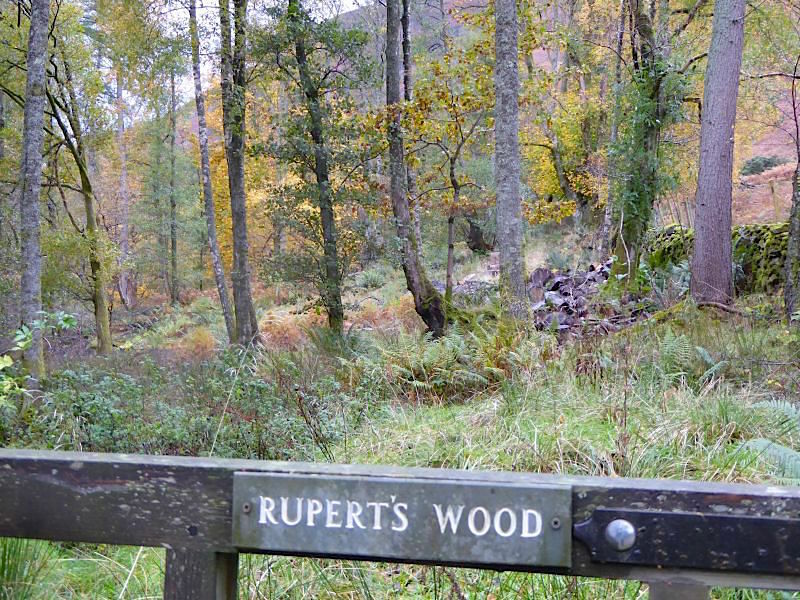 If you ever had a Rupert Bear annual when you were a youngster you will know what I’m on about. 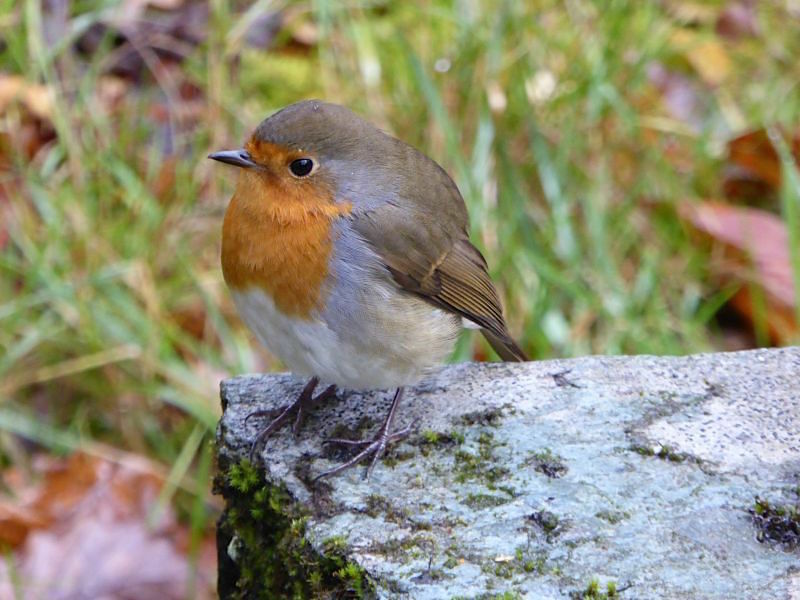 We did find a robin though, although strictly speaking it found us. We had just packed everything away after our lunch stop so there were no titbits or leftovers, no wonder that face looks a bit miffed. 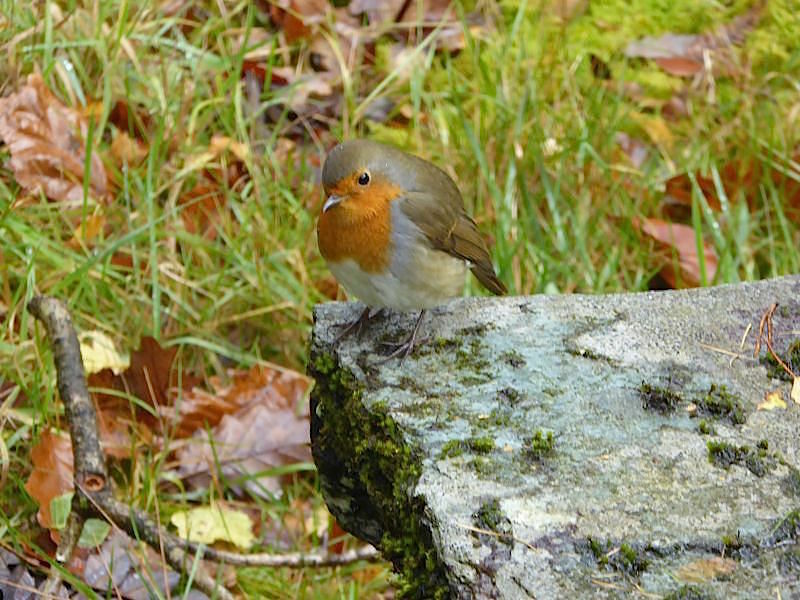 Our lunch spot, the robin was now under the table looking for anything we might have dropped. 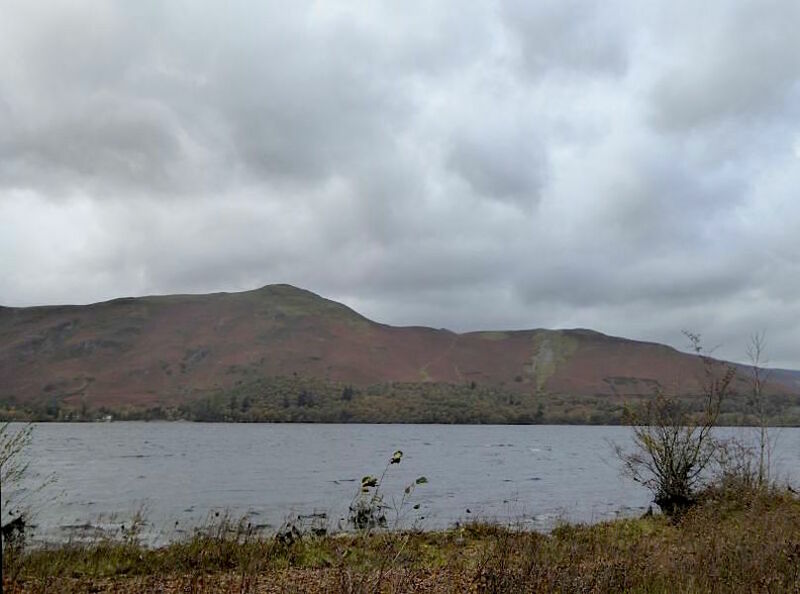 Looking back at Catbells from the boardwalk, made from recycled plastic bottles apparently, at the southern end of Derwentwater. 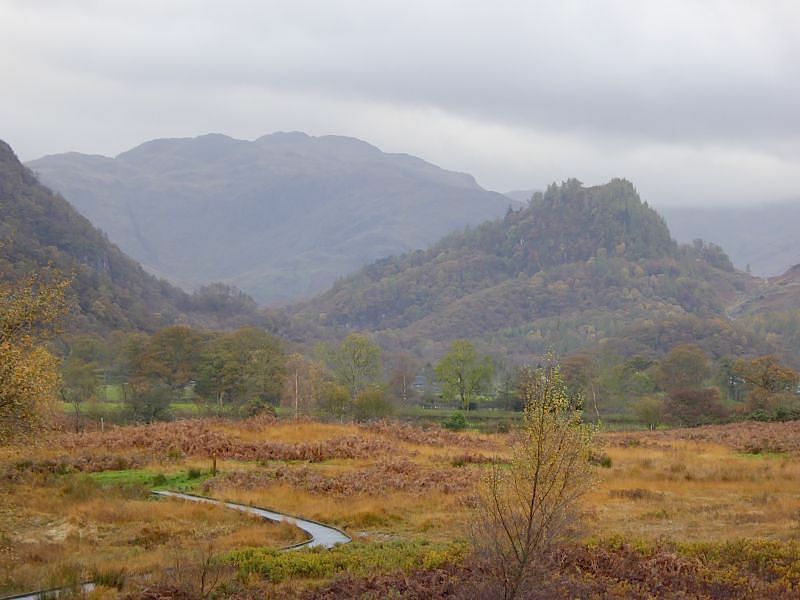 Castle Crag, on the right, and rain clouds over Borrowdale, as we continue along the boardwalk. 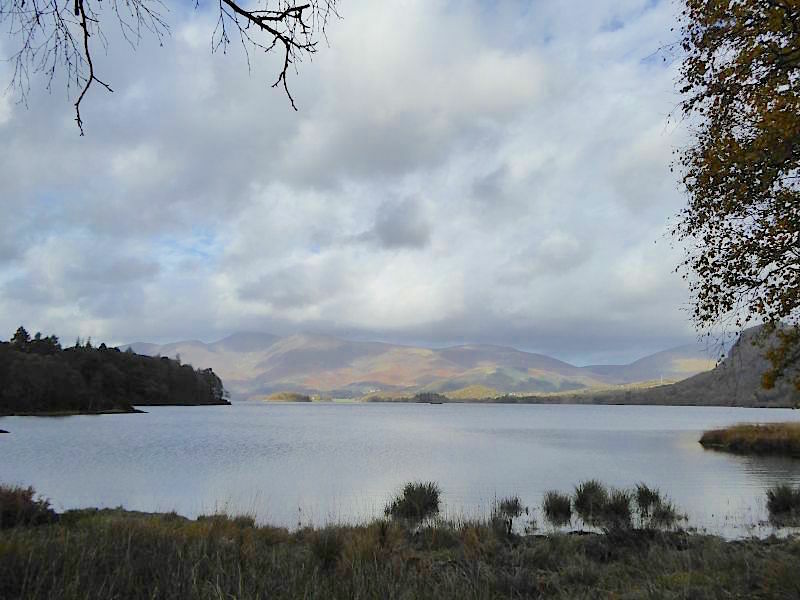 A brief spell of sunshine brightens up the Skiddaw fells as we reach the southern end of Derwentwater. 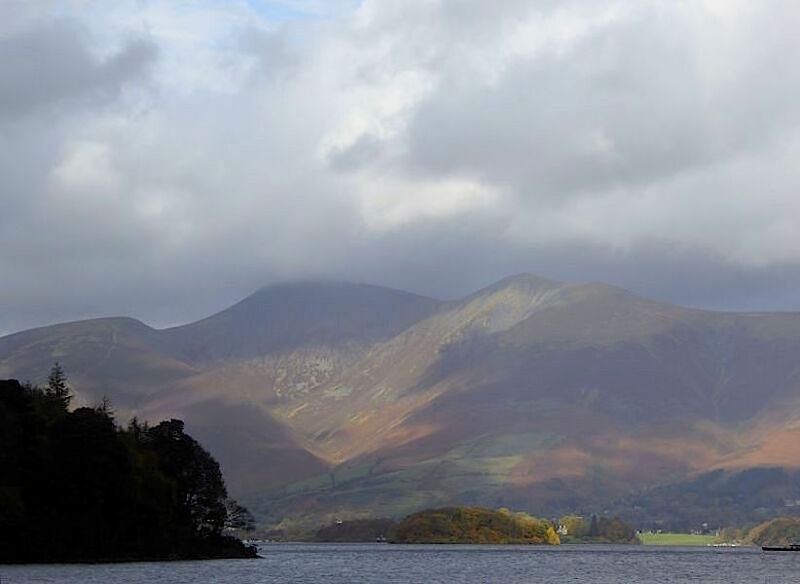 A close up of the sunshine over the Skiddaw fells while it lasted. 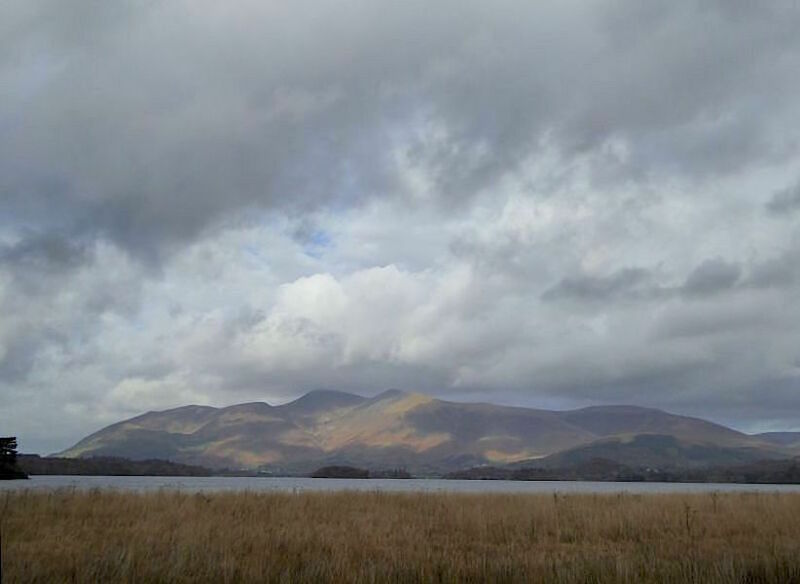 Some brightness over Skiddaw but it never came our way. 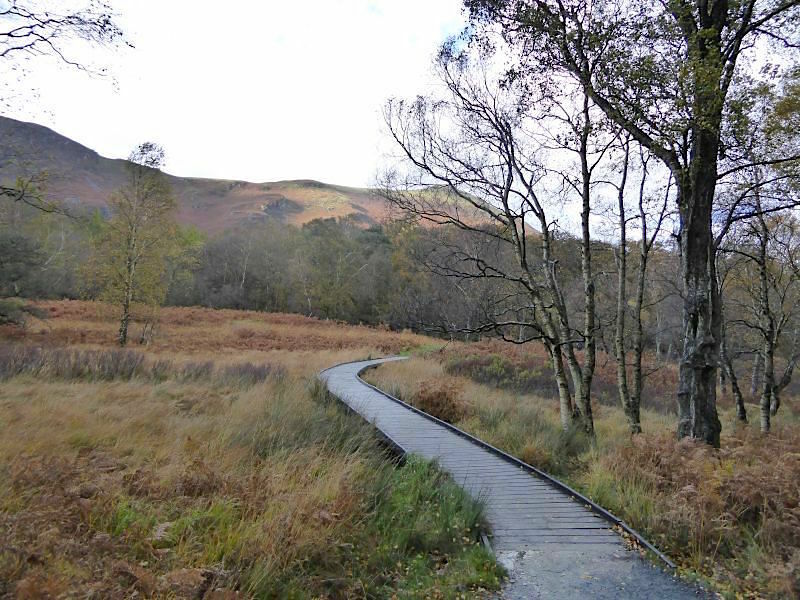 Catbells, as we continue on the boardwalk across the southern end of Derwentwater. 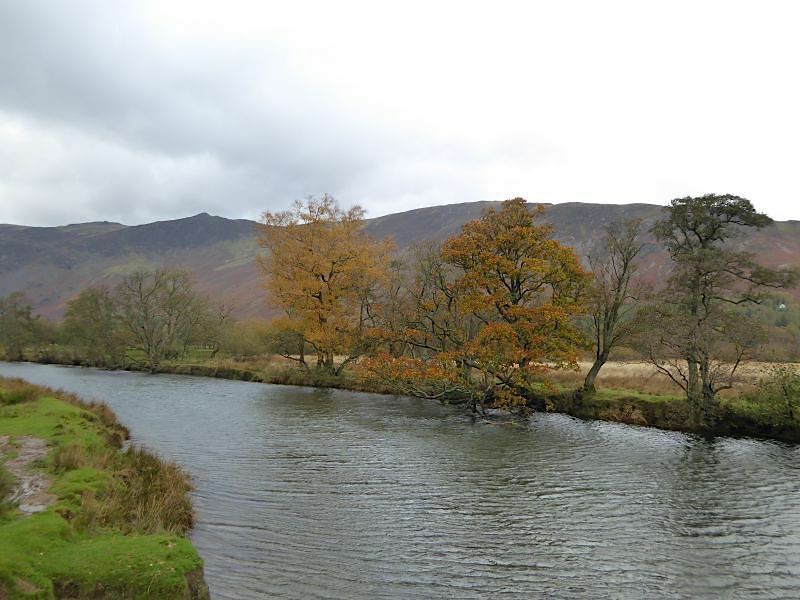 A look downstream as we reach the river Derwent. 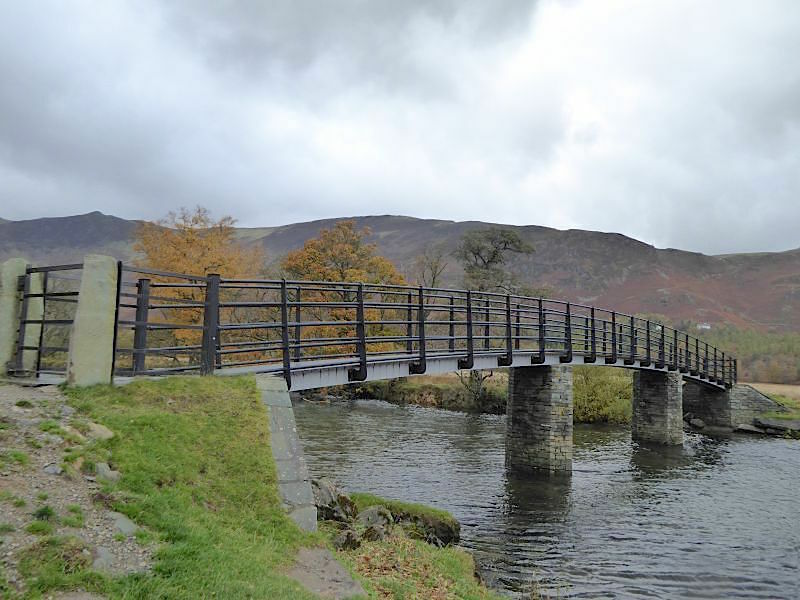 The bridge crossing over the Derwent known locally as the ‘Chinese Bridge’. 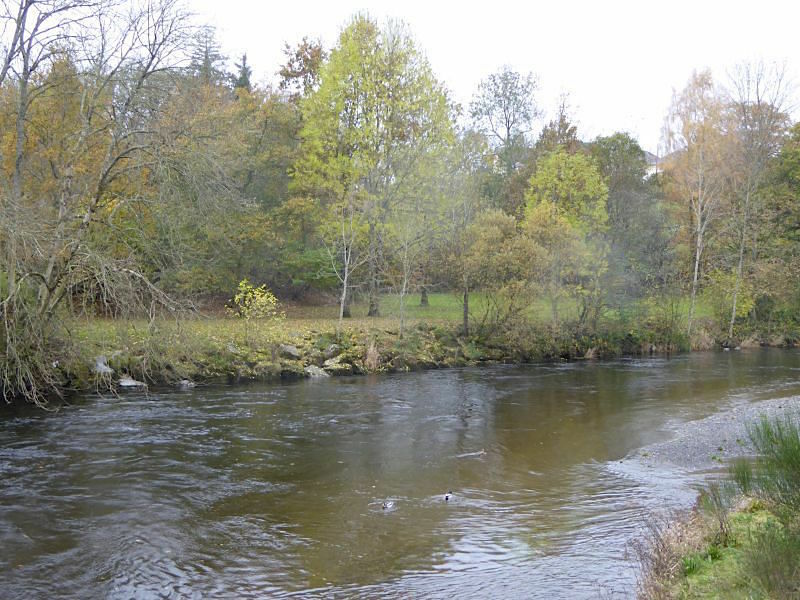 Looking up the river from the Chinese Bridge. 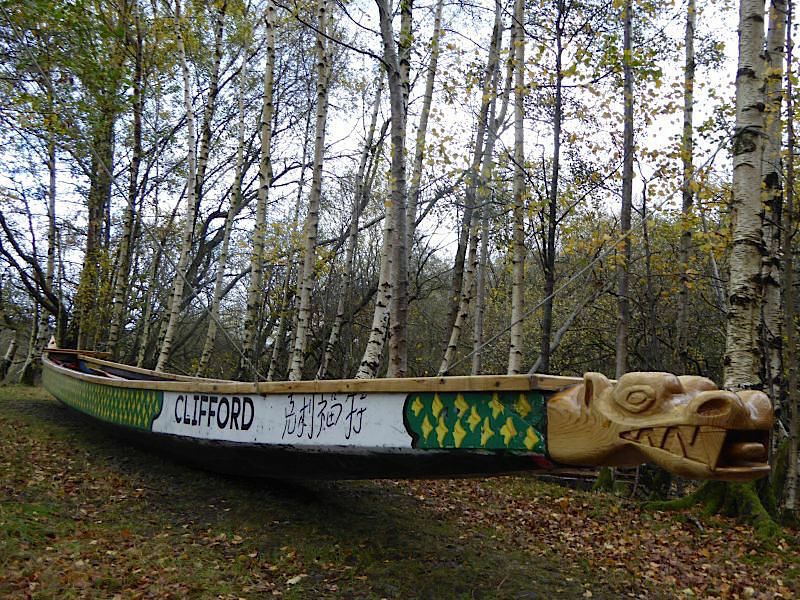 A dragon boat near the jetty at the Mary Mount Hotel. 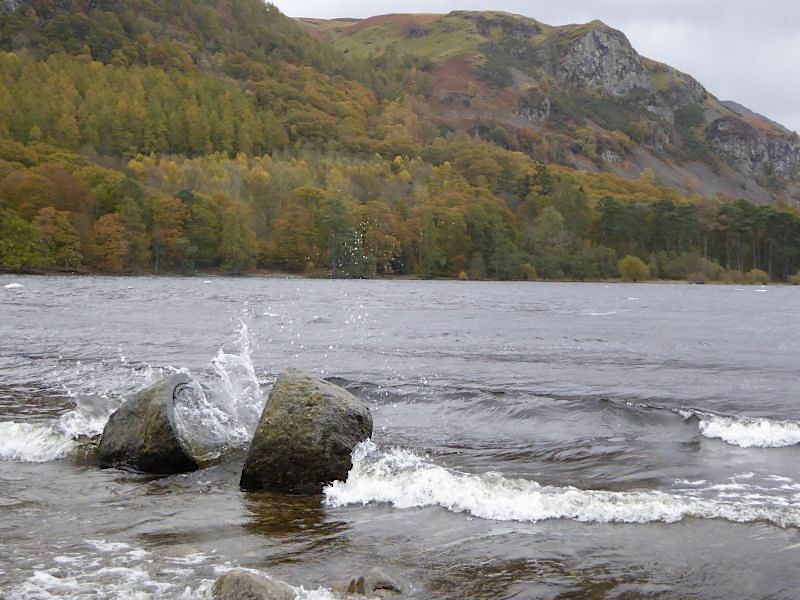 Catbells across Derwentwater, the wind and waves were really picking up at this point. 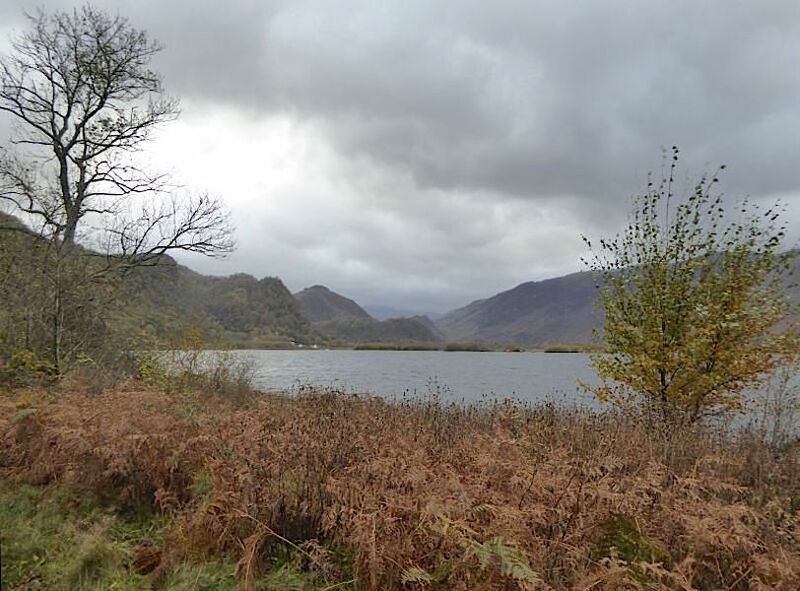 Looking back into Borrowdale as we continue up the eastern shore of Derwentwater. One of the many bridges we crossed today. 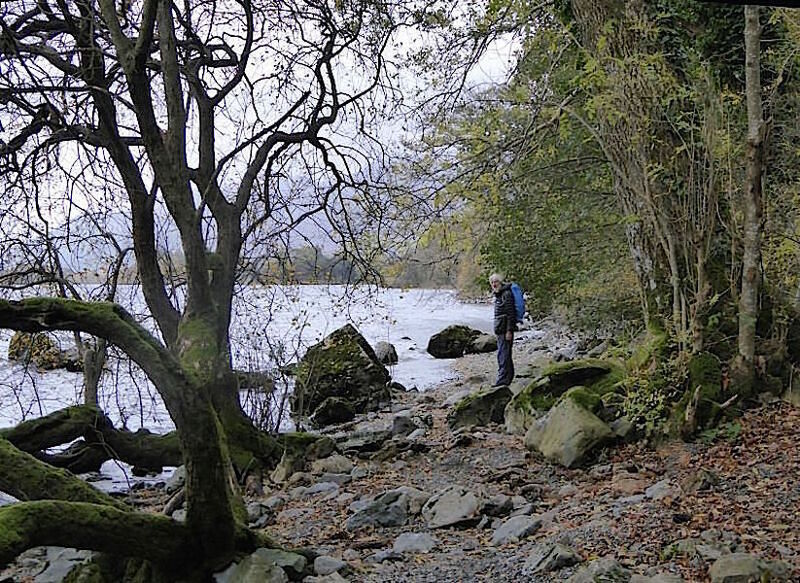 Walking along the rocky shoreline, which was a bit tricky at times with such a blustery wind blowing. 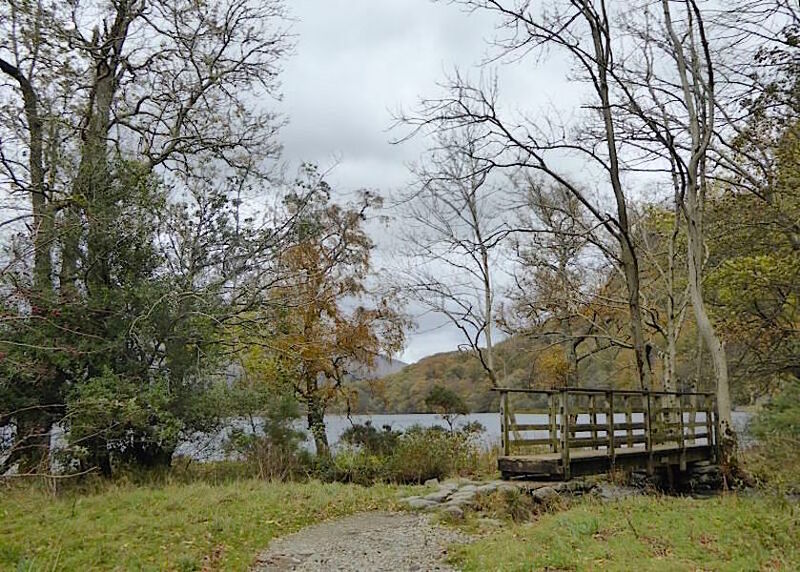 It looks like we’re about to run out of lakeside path. 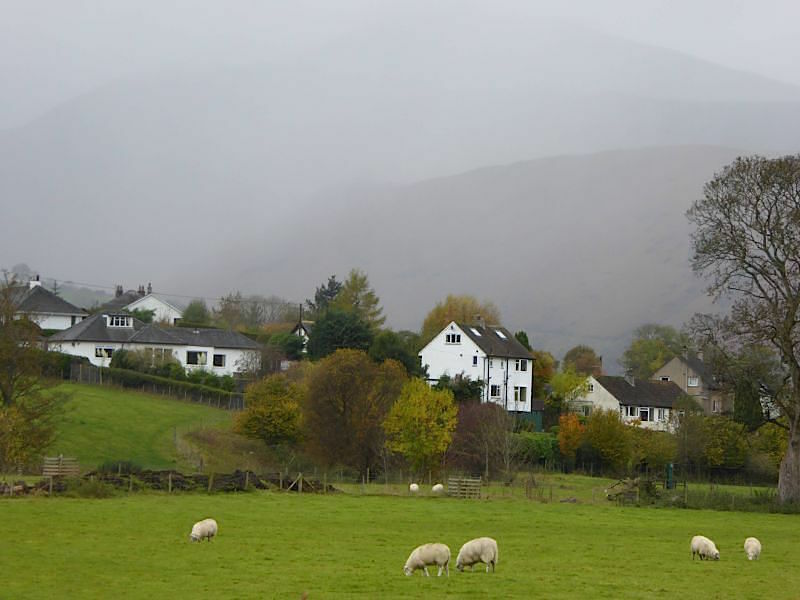 Now it really was getting very squally and Borrowdale was getting drenched. 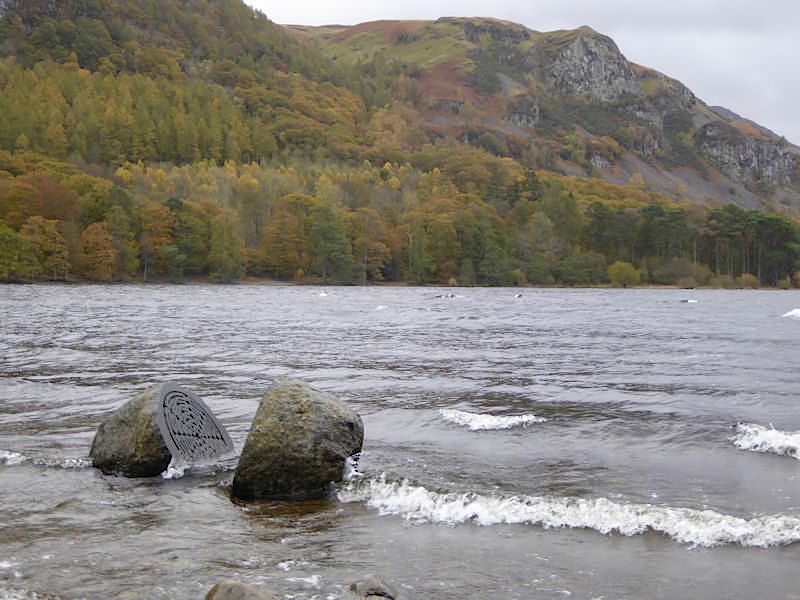 The centenary stone at Calfclose Bay, often high and dry but not today. 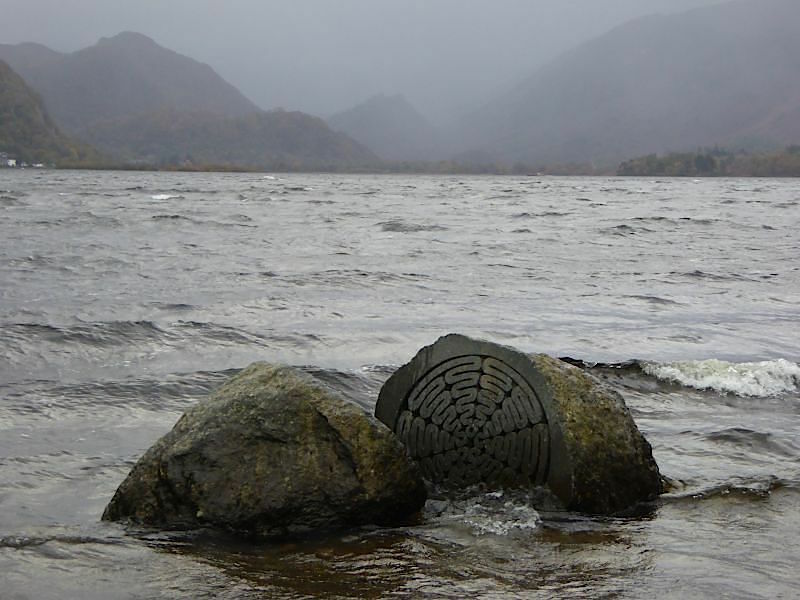 This large boulder of local Borrowdale volcanic rock was split and carved inside by Peter Randall-Page to commemorate the National Trust’s centenary in 1995. Its located on the shore at Broomhill Point. 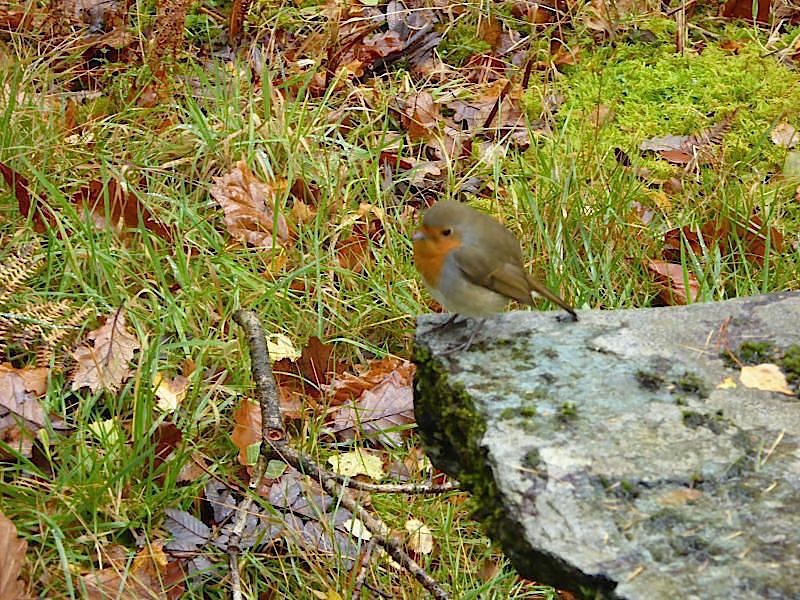 Moving round to get a different view, and then …..
….. splat! 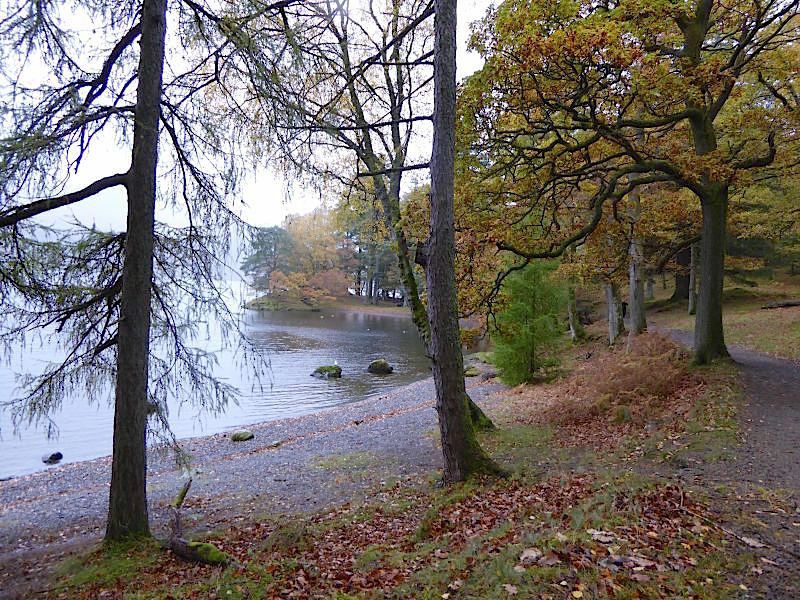 On the far shore is Great Wood and Falcon Crag. 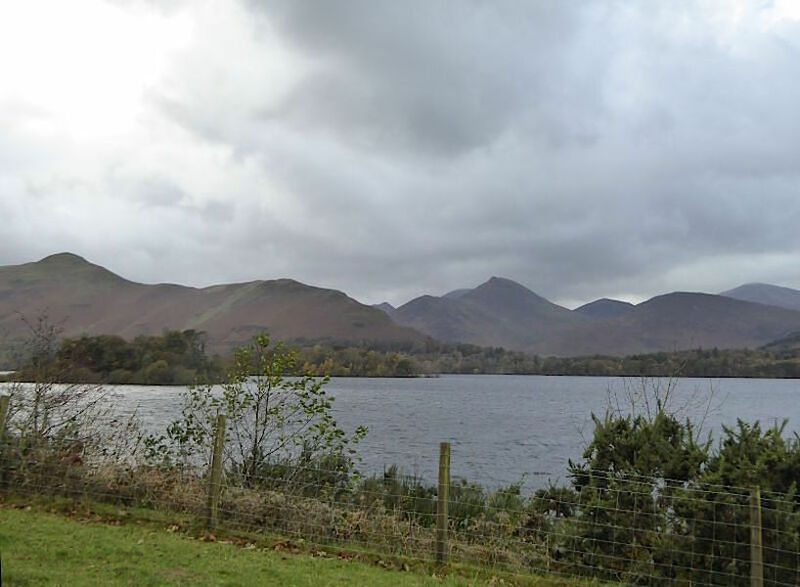 Looking over to Catbells, Causey Pike, Outerside and Barrow. 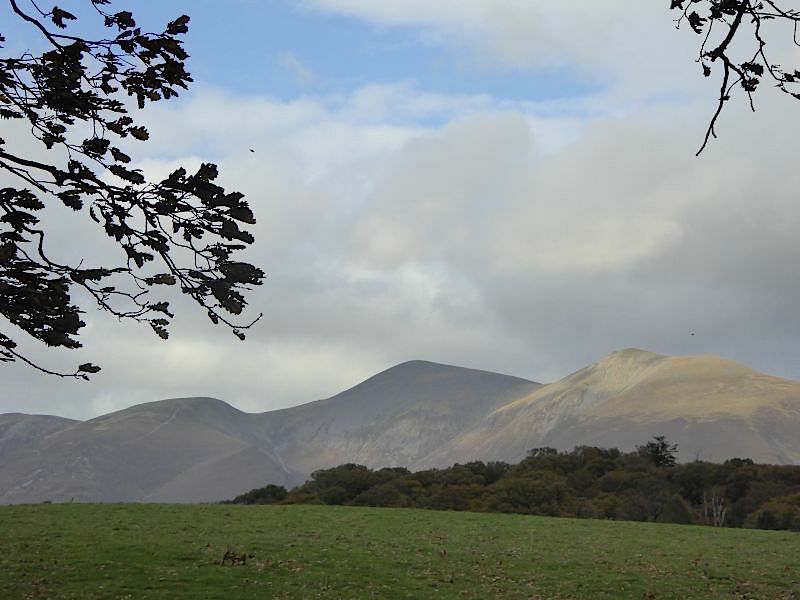 The only places catching what sunshine there was today were the Skiddaw fells, now free of cloud. 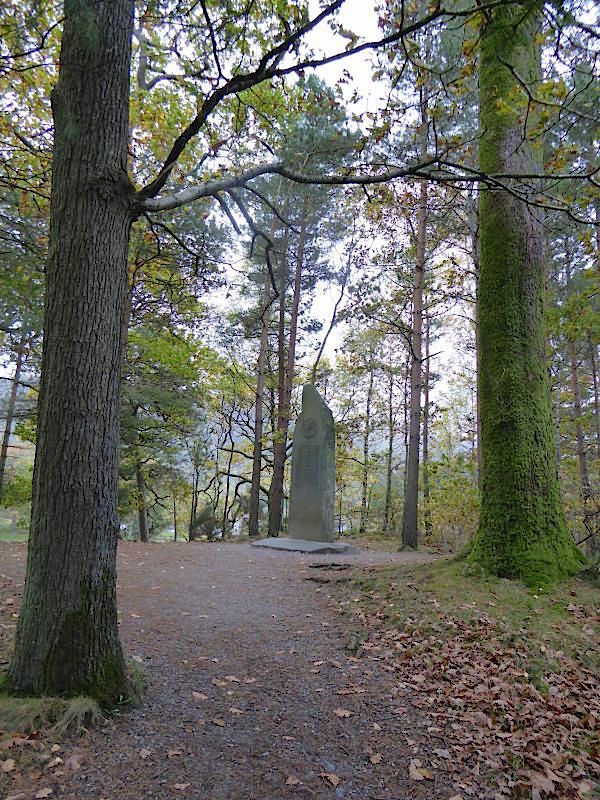 The John Ruskin memorial on Friar’s Crag. The monument is a Grade II listed structure. 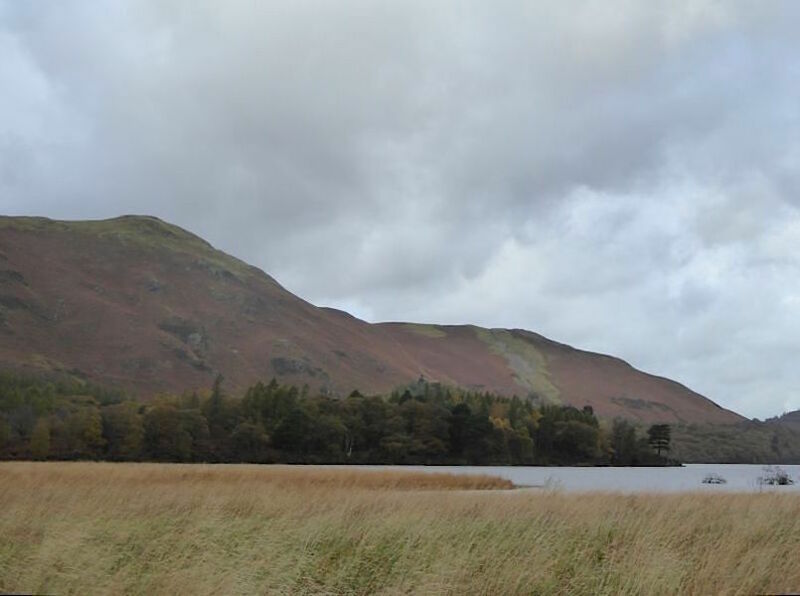 The few square yards round the memorial were the first bit of the Lake District to become the property of the National Trust. 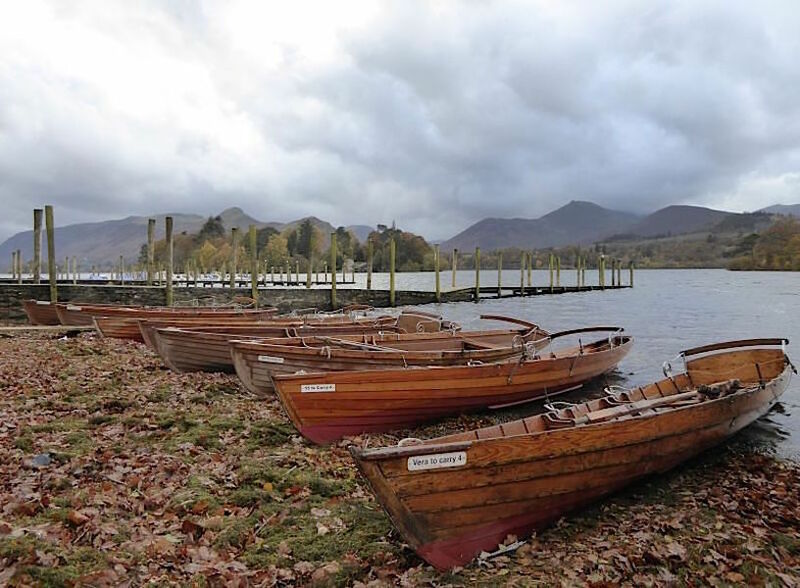 The boat landings at Keswick and the end of our circuit of Derwentwater. 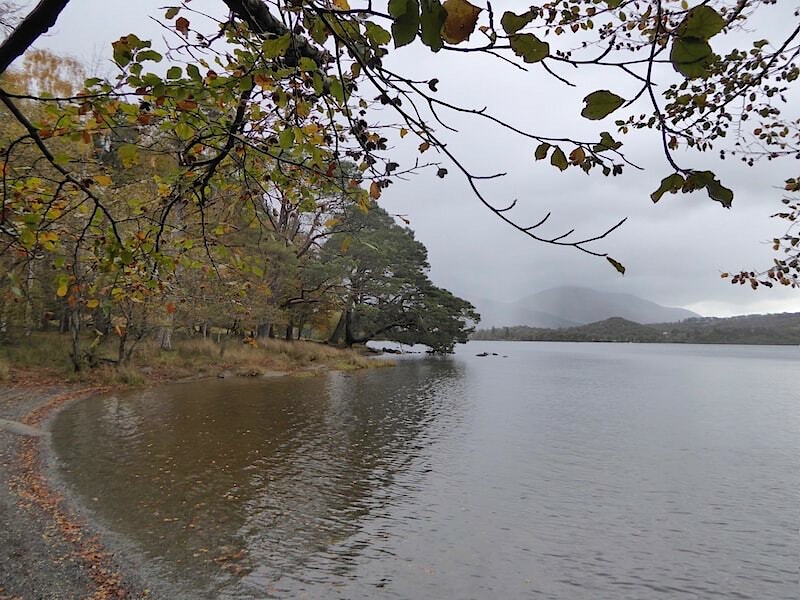 The sight of all the leaves littering the boat landings and remembering that the clocks go back this weekend, marking the end of British Summer Time, is somewhat sobering, but we’ve had a very enjoyable if rather damp walk and that’s all that really matters. 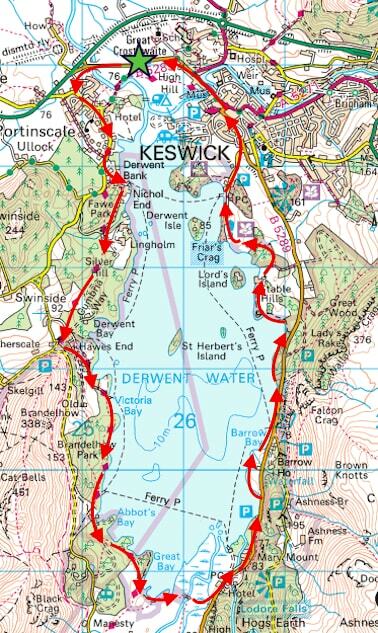 Shall we round it off with fish and chips in Keswick? Yeah, why not?